1. In the wild, bears can live as long as 30 years. When they are in captivity, they can live much longer. The oldest bear in captivity died at the age of 47. 2. Bears are very intelligent mammals. They have been observed in throwing a rock into a bear trap to set it off so they can grab the bait and eat it in safety. 3. Every species of bear except for the polar bear is an omnivore, meaning that they eat both meat and plants for survival. The polar bear is strictly a meat eater, or carnivore. 4. A bear can run as fast as 40 mph. This is fast enough to catch a horse and it’s also about 13 mph faster than the fastest human, which has been recorded at 27 mph. 5. The normal heartbeat for a bear is about 40 beats per minute. When they are hibernating, their heartbeat drops to about 8 beats per minute. 6. 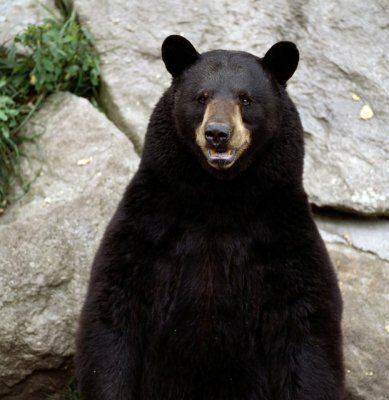 The most common bear in the wild of North America is the black bear. They are found in several US states, parts of Mexico and in every province in Canada. 7. When a female bear is impregnated, her eggs become fertilized right away. However, they do not attach to her uterine walls to begin developing until several months later. 8. A group of bears is referred to as a sleuth or a sloth. Male bales are called either boars or he-bears. Female bears are called sows or she-bears. 9. There are eight species of bear, including the Malayan Sun Bear, Asiatic Black Bear, Polar Bear, American Black Bear, Spectacled Bear, Sloth Bear, Giant Panda and the Brown (Grizzly) Bear. 10. Female bears give birth to litters of one to four cubs at a time. 11. Black bears are not necessarily black. They can be found in a wide range of colors, including yellow, cinnamon, brown and even white. 12. Several US states have adopted the black bear as their official mammal, including New Mexico, Louisiana, and West Virginia. 13. An adult bear, on average, has 42 teeth. 14. Bears are native to four continents – North America, Europe, South America and Asia. They have never lived in Antarctica or Australia. However, there have been bear fossils found on the African continent. 15. The species of bear that hibernate usually do so for 3 to 5 months at a time. 16. When bears hibernate, they do not defecate the entire time. However, their body recycles their body waste into a protein to help provide nourishment. This process is something that scientists do not understand. 17. Most species of bears walk like humans, by putting their feet flat on the ground. This is called “plantigrade” and bears are one of the few mammals that walk this way. 18. The Native Americans used to call bears “the beast that walks like a man” because they can walk on their hind legs for short distances. 19. Bears have been observed eating all kinds of non-edible things, such as engine oil, rubber boots, and even snowmobile seats. 20. Six of the eight species of bear have been listed as either vulnerable or threatened with extinction. The two that are not considered at risk are the brown bear and black bear species. 21. Contrary to popular belief, koalas are not in the bear family. They are in the marsupial family. 22. The size and weight of bears vary depending on the specific species. However, they can get as tall as 6.5 feet and weigh as much as 600 pounds. 23. The reproduction rate for the grizzly bear is one of the lowest rates of any land animal in all of North America. 24. Black bears have claws that are curved and short, which helps them climb trees easily and quickly. 25. Bears have a sense of smell that is even better than a dog’s sense of smell.